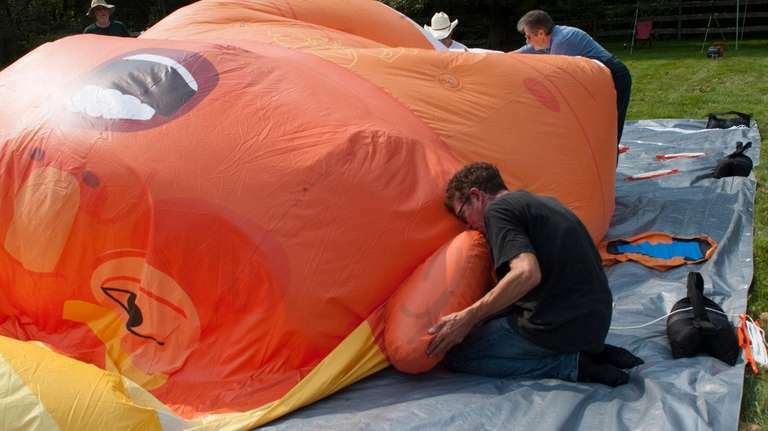 Jim Girvan and Didier Jimenez-Castro of New Jersey were inspired by the balloon that floated over London when President Donald Trump visited the United Kingdom during the summer. Baby Trump's coming to America. 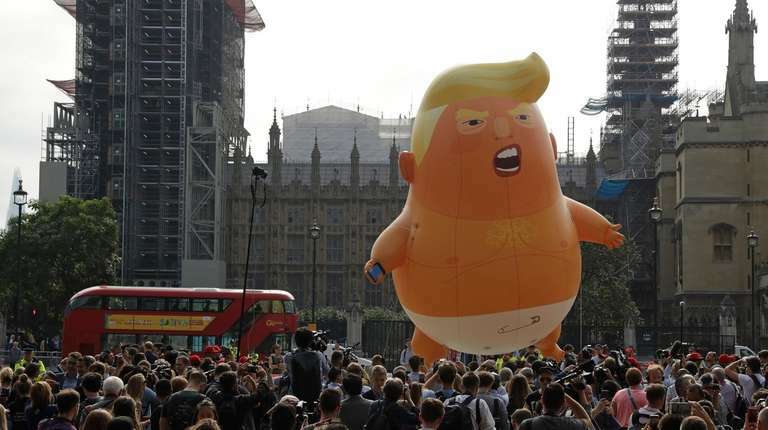 Twenty-foot helium balloons depicting the commander-in-chief as a diaper-wearing baby will be bouncing around the country ahead of the midterm elections, organizers of the Baby Trump Tour say. Jim Girvan, 65, of Branchburg, and Didier Jimenez-Castro, 30, of Hillsborough, both in New Jersey, were inspired by the balloon that floated over London when President Donald Trump visited the United Kingdom this summer. "It's all about pushing back against him and showing people what he really is," Girvan said. He calls the president "a petulant child with a cellphone and a Twitter account." Propelled by a GoFundMe campaign that raised $23,748 from more than 1,000 people, the duo bought six giant balloons — or "sextuplets" — and the tour is working with organizations to determine where the balloons will pop up. The Baby Trump Tour debuted in West Palm Beach, Florida, on Sept. 22, with an appearance at a gathering marking the anniversary of Hurricane Maria’s devastation of Puerto Rico. Another event followed in Maplewood, New Jersey, on Sunday. Organizers are finalizing a Manhattan appearance at Battery Park on Oct. 27, Girvan said. The White House did not respond to a request for comment on the Baby Trump Tour. Bedminster, New Jersey, Committeeman Lawrence Jacobs, a Republican, said Bedminster has a free speech zone about 2 miles from Trump's golf course where folks can gather and express their opposition, and where others have expressed their support for the president. The balloon is probably too big for the free speech zone, Jacobs said, "But if someone can find the right place to do it, so be it." Girvan said it's been challenging to find a location in Bedminster. It could be one open to the public, "but we're not averse" to a private property "close to his golf course where it's being flown for an audience of one." Girvan, who is retired, also organizes the People's Motorcade, a Saturday gathering of cars with signs that drive past Trump's Bedminster golf course. He says the People's Motorcade is the organization behind the Baby Trump Tour. Girvan said the balloons, which cost $2,400 a pop, are near-replicas of their UK sibling. However, to meet Federal Aviation Administration requirements to be near the president, the balloons "can't fly over 150 feet, it has to be securely moored and it has to have an emergency release." So the American Baby Trumps were manufactured with a release zipper — along the front of the diaper — which would tear a hole in and deflate the balloon if it broke from all eight of its moorings. Jimenez-Castro's balloon project allegedly has brought him blowback from the president's supporters, who he said unsuccessfully tried to get him fired from his jobs at a homeless shelter and supermarket. "You're literally trolling the president on a national stage. Not everyone keeps their job after that," Jimenez-Castro said, speaking about his work at the shelter. He described their project as "Let's go see Baby Trump, take pictures, laugh, hang out. If you're not registered to vote, register to vote." Girvan said his goal is to get Trump out of office, and plans to keep the balloon tour going until he's no longer president. Afterward, "I think we'll have them join the Space Force."